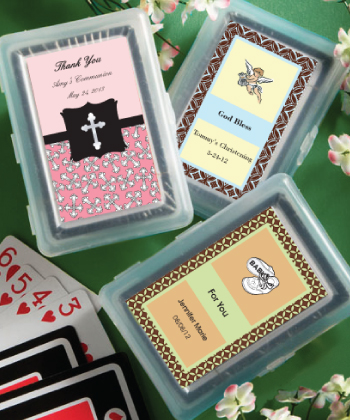 Truly unique personalized First Communion playing cards favors, your guests will enjoy your practical touch. 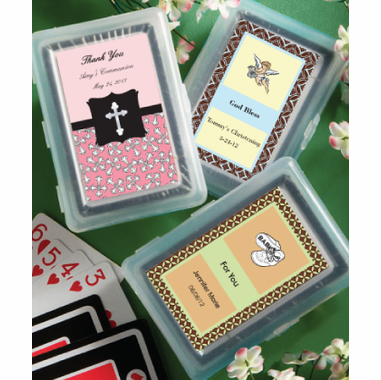 Each measures 2½" x 3½" and includes a full playing card deck with a standard suits design tucked inside a hard molded plastic case that opens like a book and provides a perfect place for you to apply the customized label of your choice. Your personalized First Communion card labels are not applied to the card cases prior to shipping - assembly is required for the personalized labels to be affixed to the box. 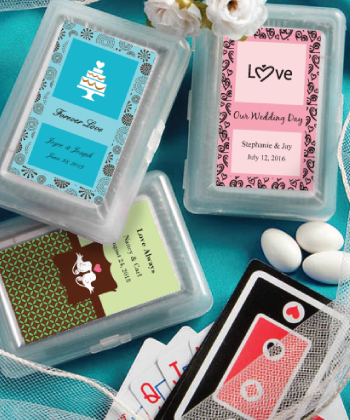 Although the label is personalized and offers a variety of designs, please be aware each card is not personalized. These were so easy to assemble, took all of 7 minutes to place the personalized sticker on the card case. And they were a huge hit at the party! !